Financial markets are acting like Italy has just taken a big step to solving its banking crisis. They’re half right. Although the scale of Italy’s problems with bad loans is systemic – a staggering 200 billion euros ($212 billion), according to the Bank of Italy – that doesn’t excuse individual banks from doing what they can to get themselves out of the mess. The radical plans unveiled Tuesday by Unicredit (uncff), the country’s second-biggest and most internationally active bank, aim at just that. The bank announced the biggest-ever capital raising exercise by an Italian company, seeking 13 billion euros in fresh capital. That was more than its entire market capitalization at the moment of its announcement. The move will allow it to write off 12.2 billion euros in bad investments (two-thirds of it from the bank’s domestic loan book, the rest tied in various ways to its pell-mell expansion pre-2008). A big chunk of the bad loan book is being sold to U.S.-based financial giants Fortress Investment Group (fig) and PIMCO, freeing up space for new and hopefully better lending. Trading in Unicredit stock over the past two weeks. Jean Pierre Mustier, the Frenchman who took over as Unicredit CEO earlier this year, knew that he couldn’t ask the market for support without slimming the bank down drastically. Since taking the helm, he has sold Pioneer, Europe’s sixth-largest fund management group, and 20% of online broker Fineco to free up more capital. He’s also dumped most of Unicredit’s stake in Pekao, Poland’s largest bank, and withdrawn from other Eastern European markets, such as Ukraine, in which the bank once had high hopes. By 2019, Unicredit will have cut its staff by one-third, including 14,000 job cuts at operations that are being retained. This will be Unicredit’s fourth capital raising since the financial crisis, and will be nearly twice the size of the last one in 2012. But its shares rose nearly 16% Tuesday, to a 7-month high, rewarding Mustier’s boldness. And other Italian companies are benefiting, too: The benchmark FTSE MIB index rose 2.4% to a nine-month high on the news, with four of the top six gainers being banks. The yield on the benchmark 10-year Italian government bond, which prices in (among other things) the risk of Italy needing a bailout, fell 0.14 percentage point, to its lowest in six weeks. In all, the measures do represent a big step that may be enough to save Unicredit – although the fact that the bank’s equity will still be worth barely 60% of its book value still warrants some caution. Nonetheless, they almost certainly won’t be enough to save Italy’s other weak banks. The European Central Bank has already rejected a request from the Italian Treasury to extend a year-end deadline for recapitalizing Monte dei Paschi di Siena (MPS), the world’s oldest and Italy’s third-largest bank. Rome’s lack of confidence in attracting 5 billion euros in market-based investment to MPS is in stark contrast to Unicredit’s ability to persuade banks to underwrite a 13 billion euro deal. Other, smaller banks have problems more similar to MPS’s than to Unicredit’s. Unlike Unicredit, they don’t have valuable or easily realizable assets like Pekao and Pioneer. What they do have is unhedged exposure to an Italian economy squeezed on the one hand by low-cost Chinese competition and on the other by having to share a currency with Germany. Despite taking billions of euros’ worth of Italian government bonds off their hands, even ECB President Mario Draghi can’t persuade the world that Italian banks can fund themselves on their own. 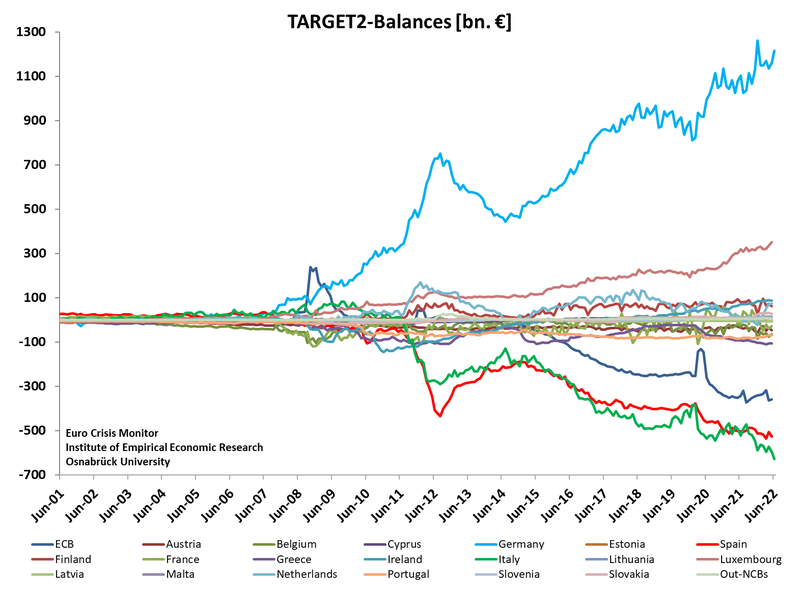 Those banks currently owe the ECB 360 billion euros. It should be obvious that in a country with an aging population, a budget deficit that allows no room for stimulus, the worst growth outlook in the EU for the next two years, and the most hostile environment for business among all of Europe’s big economies, Italy’s banks are not going to grow their way out of their problems. Barring a miracle, Eurozone taxpayers will eventually have to chip in to ease the burden, most likely in the form of a bailout similar to the one that Spain took for its banks in 2012. If they don’t, then the only way the Eurozone’s third-largest economy will be able to cope with its debts is by repaying them in a reintroduced lira, rather than in euros.